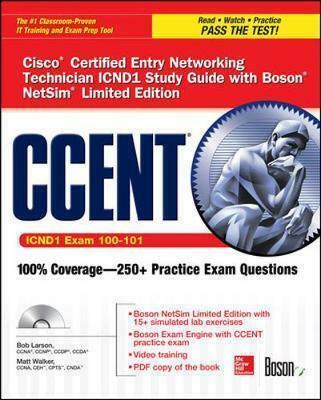 The best fully integrated study system available for ICND1 Exam 100-101With hundreds of practice questions and hands-on exercises, CCENT Cisco Certified Entry Networking Technician ICND1 Study Guide with Boson NetSim Limited Edition covers what you need to know-and shows you how to prepare-for this challenging exam. Robert E. Larson currently serves as one of 14 members of the Cisco Network Academy Advisory Board, which oversees the Cisco Networking Academy Program, operating in over 8,500 sites. He has designed computer-training courses, developed training materials, and delivered instructor-led training for 17 years, including having written two network certification books and three CCNA Instructor's Guides. He holds CCNP, CCDP, CAN, CCDA, CCAI, MCSE and MCP certifications.